I know I’ve mentioned it many times before but I’m not going to let that stop me: Saying yes to one thing means saying no to others. I repeat it so often because it is still true. Sometimes, the “no” is explicit—someone asks for something and the request cannot be granted—but it need not be. More often, the time and energy available are consumed by the committed tasks and at the end of the day, there are no resources left for the things not committed to. Stuff just does not happen. It isn’t hard to guess where I’m going with this. I recently said yes to some work for my former partners. A large chunk of my time is now committed to this worthwhile—and quite enjoyable—project and, as a result, I have less time for other things, most notably this blog. That is why my posts have been few and far between lately. Now, this is not to say that my blogging is less worthwhile or less enjoyable than the other work. Nothing could be farther from the truth. No, blogging has simply become less urgent; it remains very important to me. I admit to feeling a little discomfort with this—the puritanical worker in me wants to do everything, to get it done, now!—but I know I will catch up. Anyway, it is summer, a time when the pace is slower and more relaxed. For all I know, my readers are on vacation or tending their own gardens. Nor does my not writing about the garden mean that nothing is happening there. 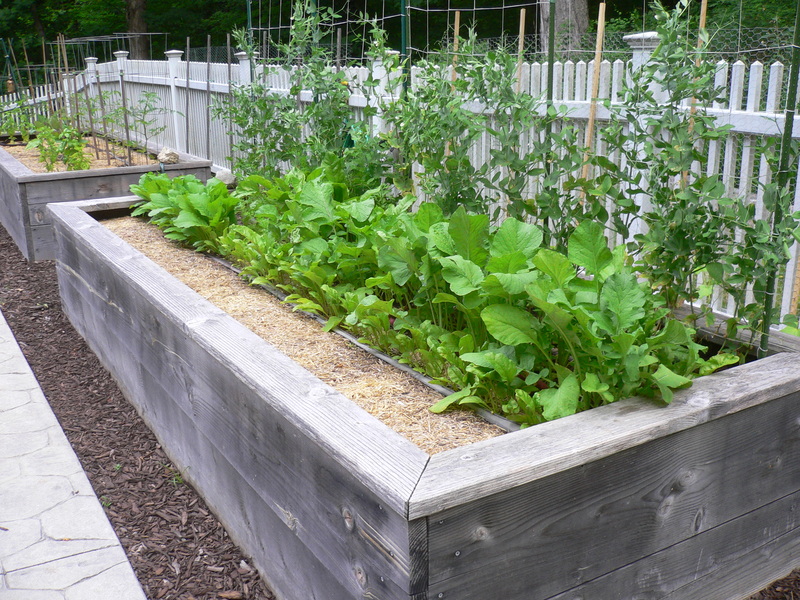 To the contrary, the planters are bursting with growth, especially the east planter with its bounty of root vegetables (most especially, the turnips) and snap peas, while the cucumbers, tomatoes, squash, eggplant, and bell peppers are preparing to carry out their own surge. The most comforting aspect of the garden is that at this time of year, it practically takes care of itself. It basks in the sun by day, receives gentle watering from the timed hoses or occasional thunderstorm in the evening, and, at intervals, enjoys a little love from Rachel and me. Because in addition to everything else we are doing, we are both still chanting “yes!” to the garden. Last week, we dug the holes (see May 4, 2014). This week, we filled them. 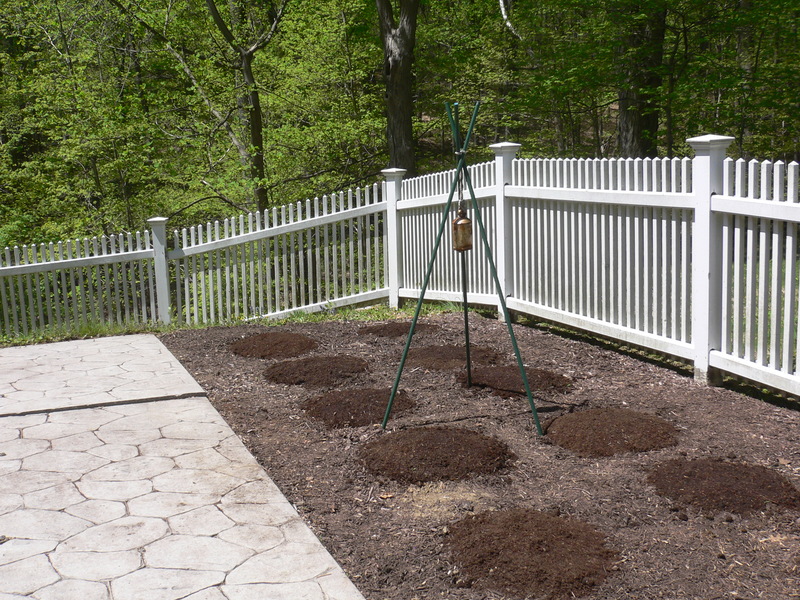 Last year, I did a careful estimate of how much soil we would need and meticulously calculated the volume of the (assumed) conical mounds of soil on top. Of course, I was very precisely wrong and underestimated the total by a wide margin. This year, I eyeballed it. Well, okay, not completely (that would be contrary to my nature). 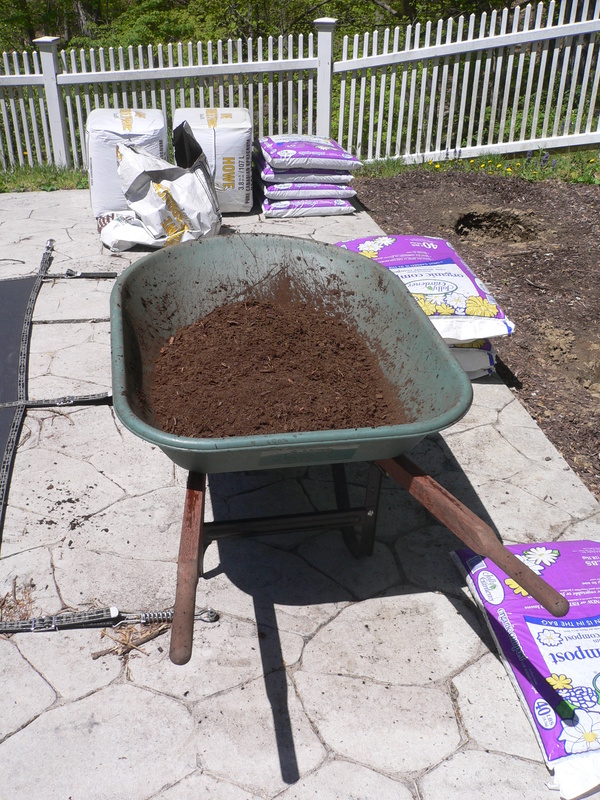 At the garden center, I figured about four bags of compost per bale of peat moss (at equal proportions) of which I guessed we needed two. 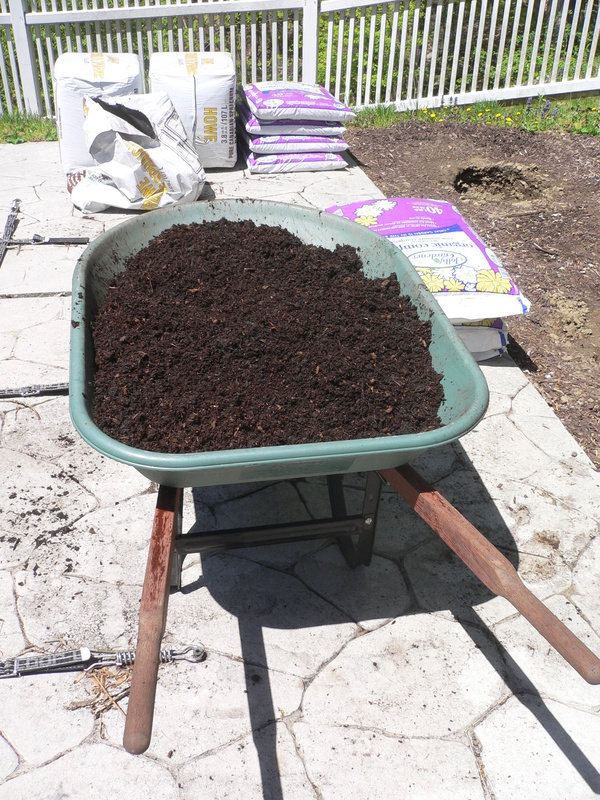 I then applied a factor of safety of 1.5 to the compost and got 12 bags. 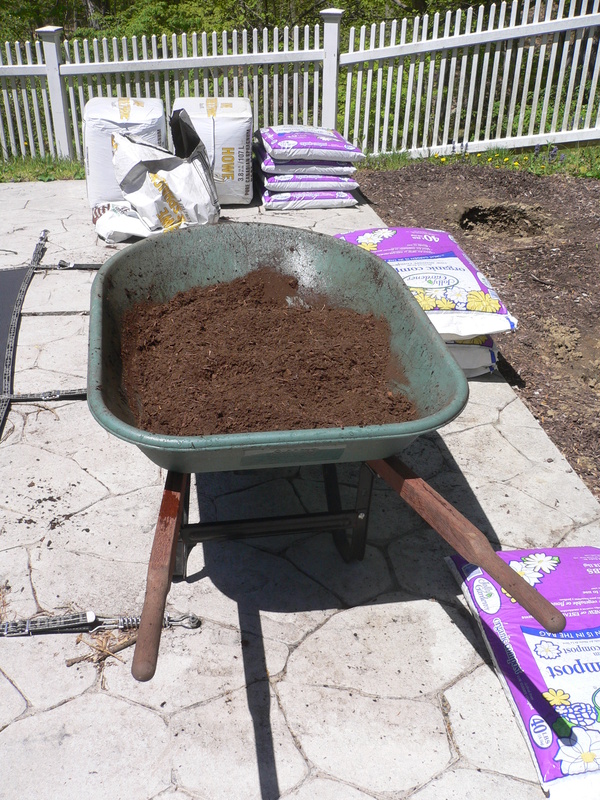 Back in the garden, I wrestled a bale of peat moss (it is quite heavy and awkward) onto the wheelbarrow and Rachel sifted in a quantity about equal to a bag of compost. 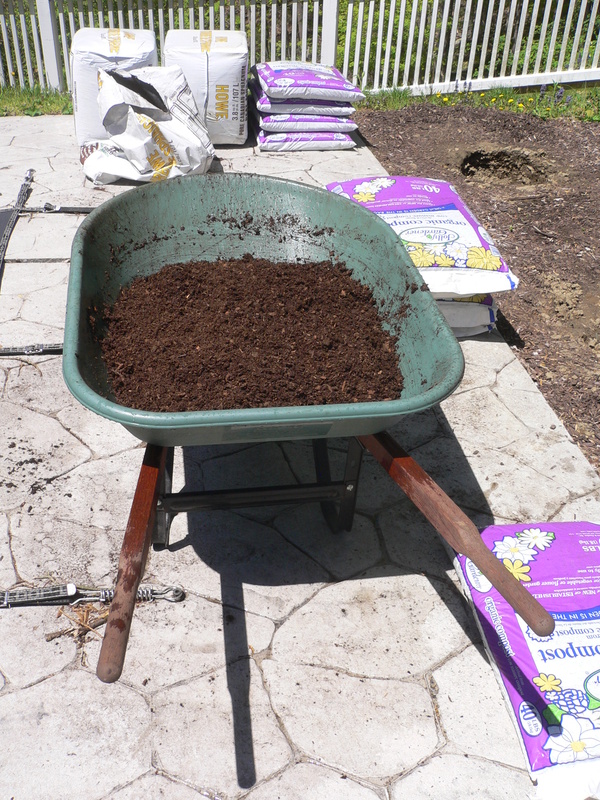 Bales of peat moss are very tightly compacted—they are almost rock solid—which made dispensing it even more difficult. 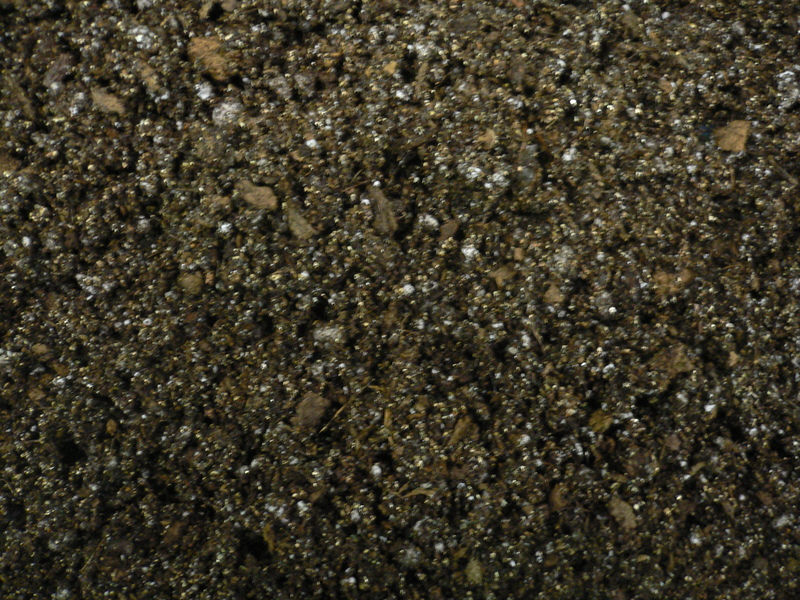 Peat moss is packaged in a bone-dry state, so we sprinkled it with water and gave it a stir. Like a magic trick, the water disappeared after only a few turns. 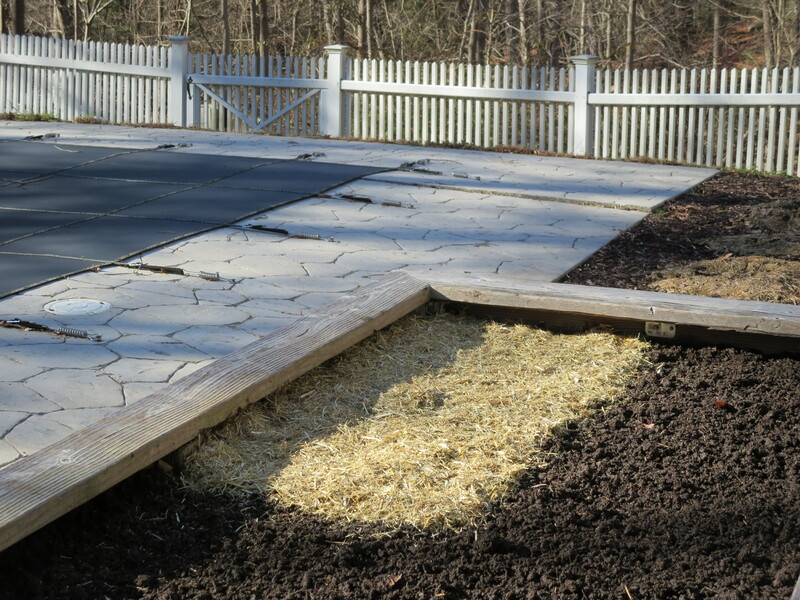 We repeated the process with similar results until finally, after five applications of water, the peat moss looked slightly damp. 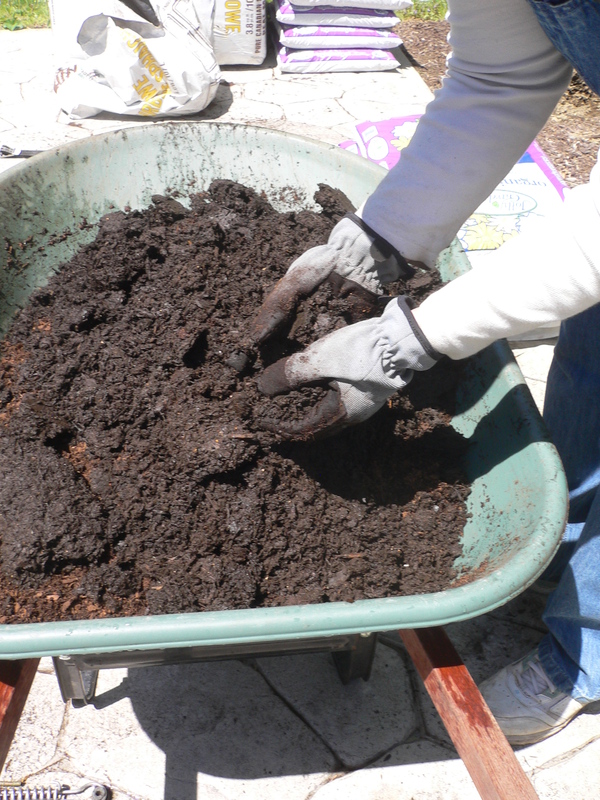 At this point, we added a bag of compost and stirred (with our hands) to incorporate. The moisture contained in the compost was sufficient to produce a workable consistency and we dumped the soil into the first hole. There was enough to fill it and to form a mound about six inches high and 18 to 24 inches in diameter. 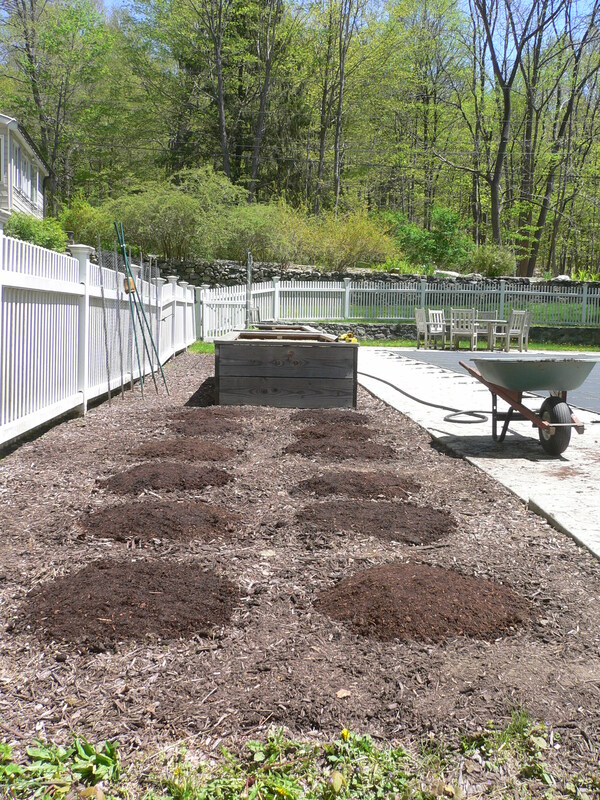 Five bags and half a bale of peat moss later, we had filled and mounded the remaining holes. We were left with almost as much peat moss as we started with (counting the bale already on hand) so once again, my estimate was way off. 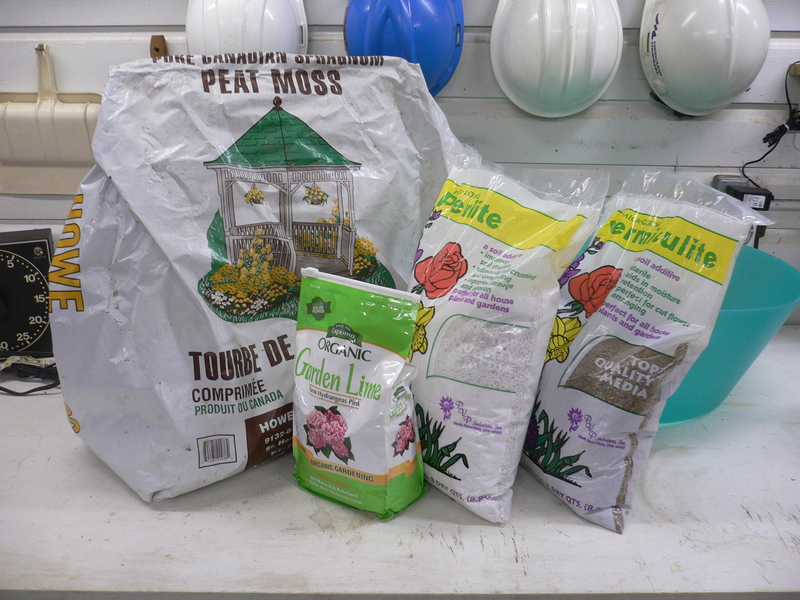 I had not taken the peat moss’s compaction into account and as a result we purchased at least twice the necessary quantity. 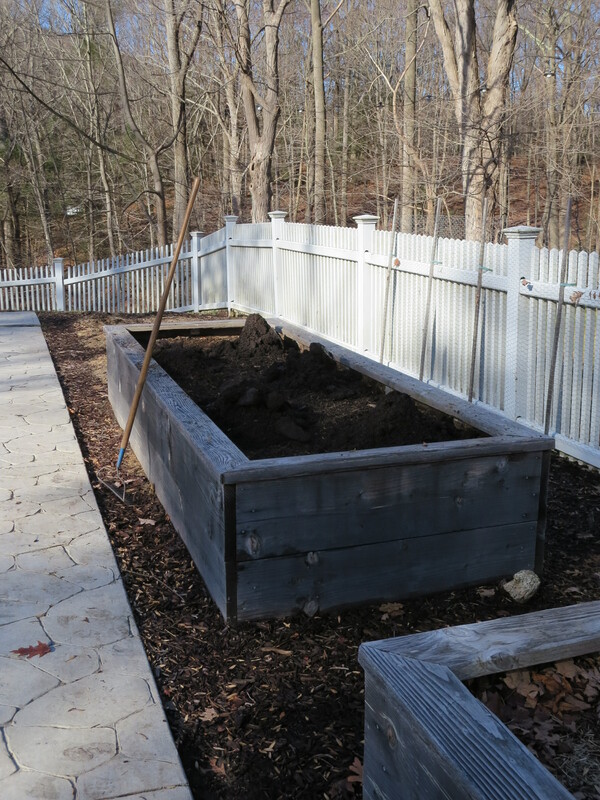 Also, my factor of safety on the compost was completely unnecessary. It’s no matter; the peat moss and compost will not go to waste. We used some of it to top off and tidy up the mounds from last year which are now ready to be planted again. 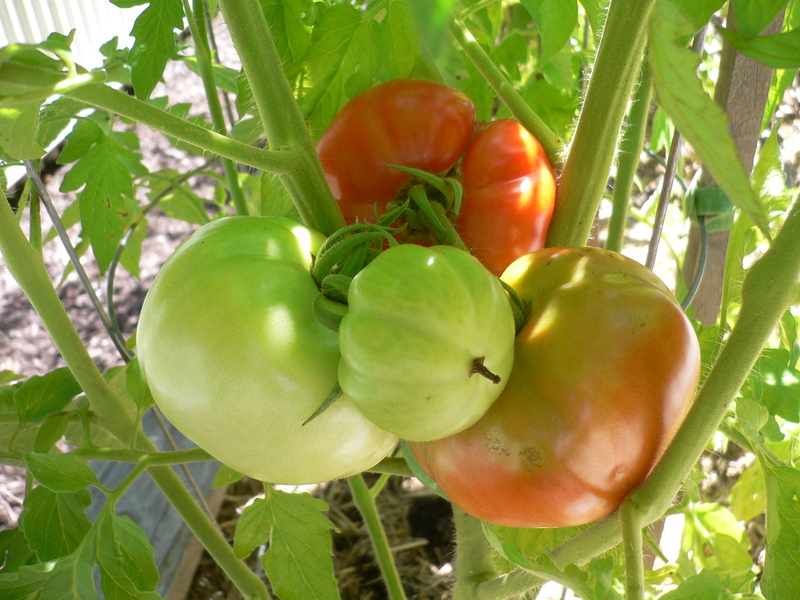 We can’t do any cucurbits (who inhabited these spaces last year) but perhaps we will try tomatoes (of which we have more than we can fit into the raised beds). 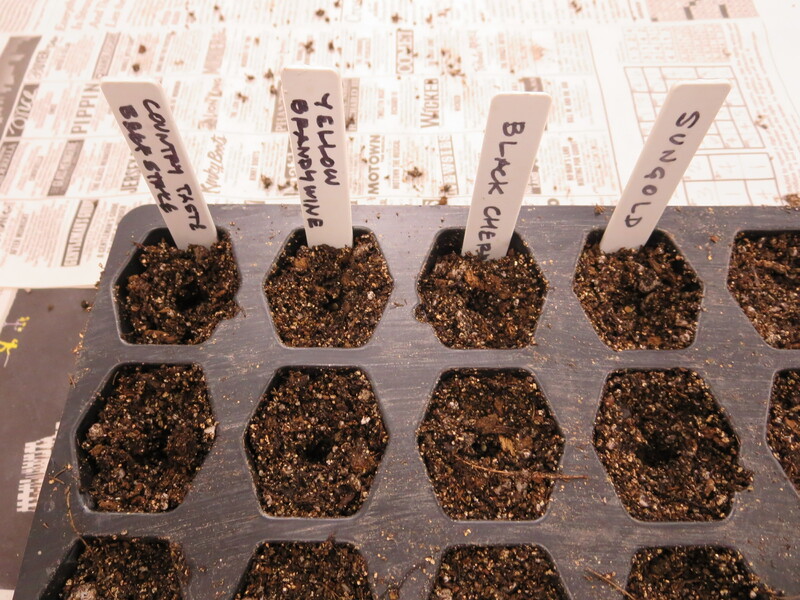 Starting plants from seed is an act of faith. It is not at all like buying seedlings or fully-grown plants from a nursery or garden center. There, one knows what one is getting (even when the previous history is not disclosed) and what happens from that point on is somewhat in the gardener’s control. 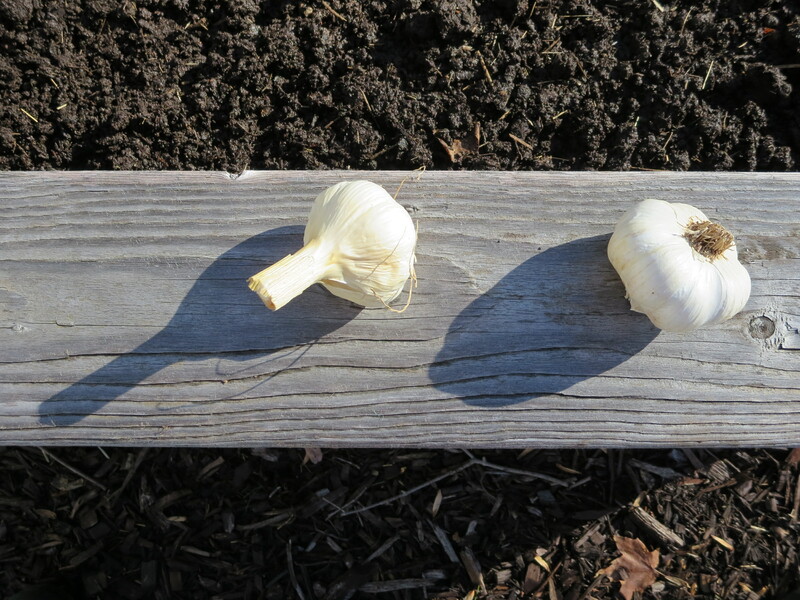 But when starting from scratch, once the gardener places the seeds into the soil, they are out of sight. 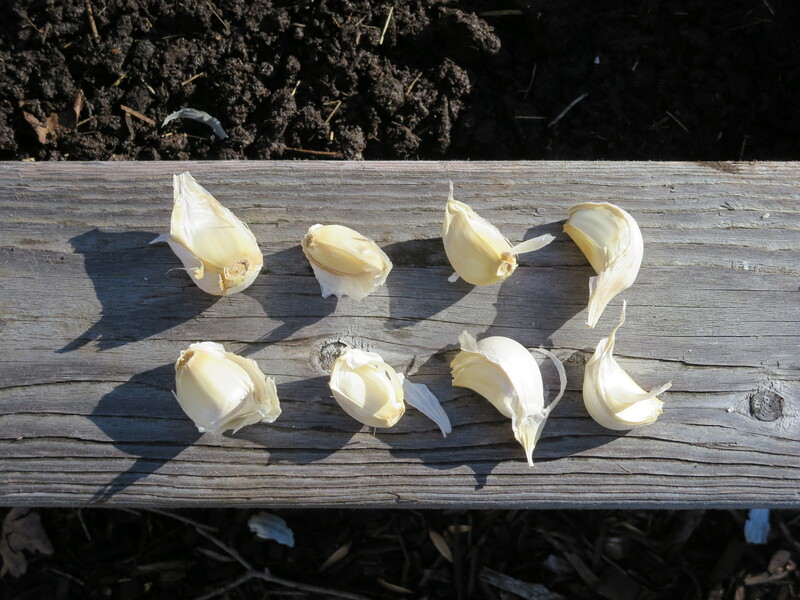 After that, it doesn’t matter whether or how often the seeds are watered or fertilized. In fact, any action (or inaction) by the gardener is probably irrelevant. No, what happens next is up to the seeds and Mother Nature. 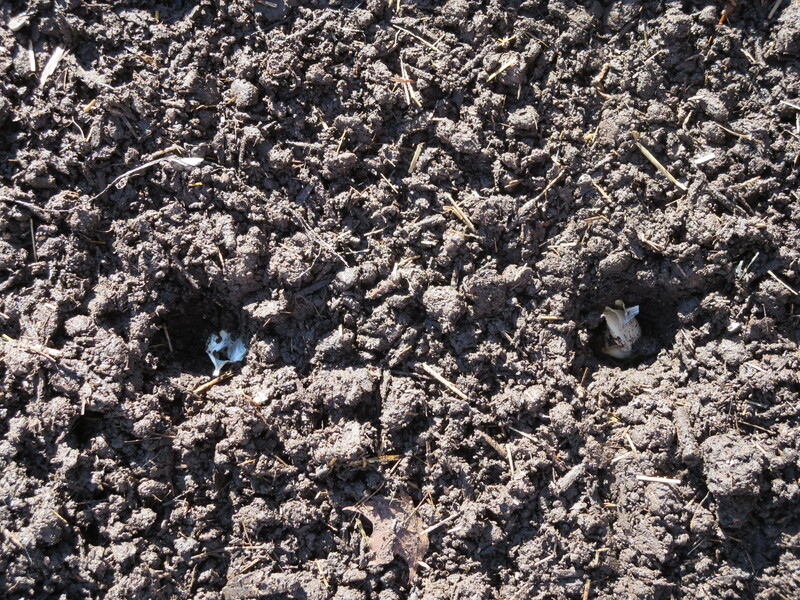 And neither is very communicative about what is going on under the soil. There is no indicator light, glowing green when all is well; a warning bell does not sound if something starts to go wrong. There is nothing even to confirm that the seeds are still there. One has to simply trust that the seeds know what they need to do and that they are actually doing it. Faith is only rewarded when the seedlings finally push up through the soil and spread their tiny cotyledons to the light. Until then, the gardener waits patiently. 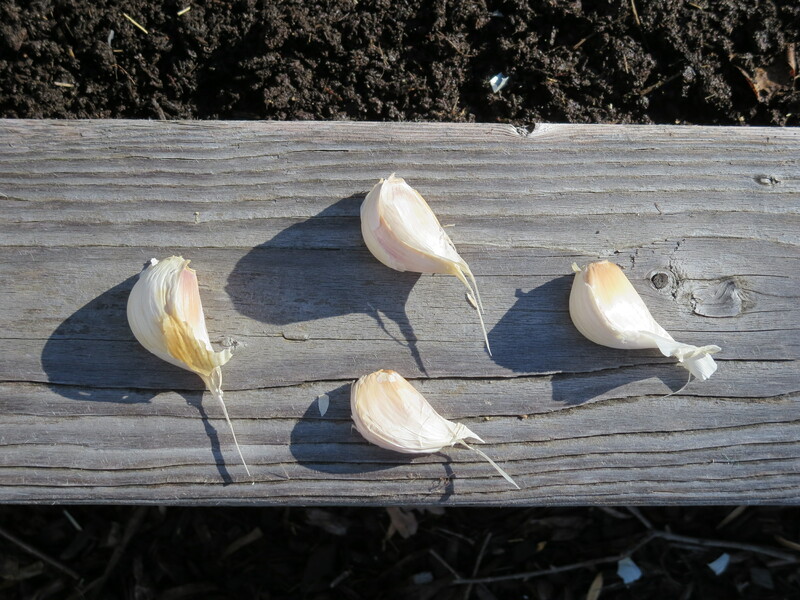 I’m happy to report that the 2014 growing season is officially under way. In our garden, anyway. 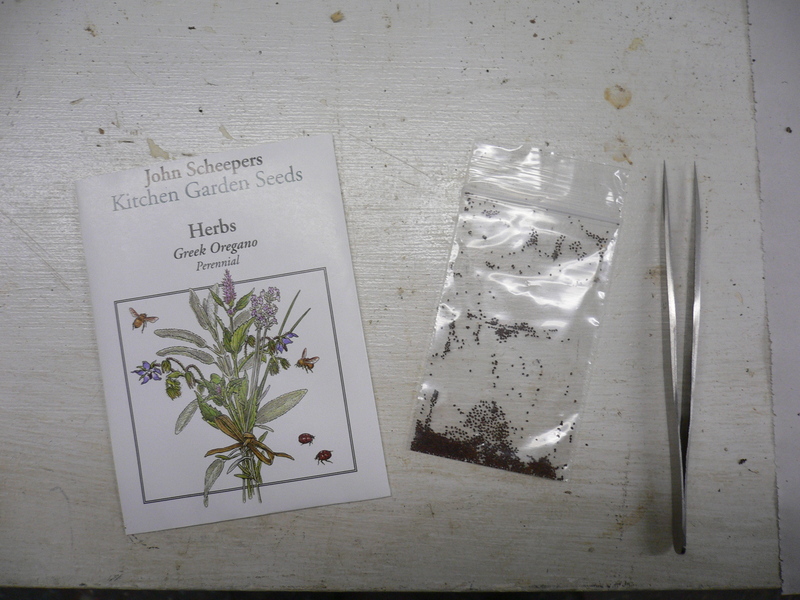 Having assembled all of the necessary parts, I found some time this afternoon to sow seeds for the herbs. 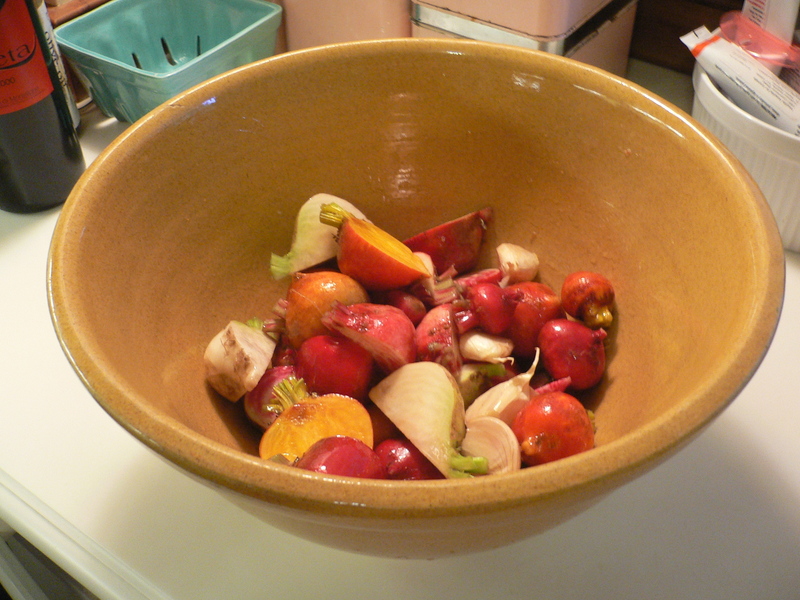 As a first step, I washed the mixing tub, seed tray and trowel with a mild bleach solution. All of these items were used last year and have been stored in the basement since. The exposure to outside elements is high and given the dark and damp conditions down here, the potential for mold and harmful bacteria is great. 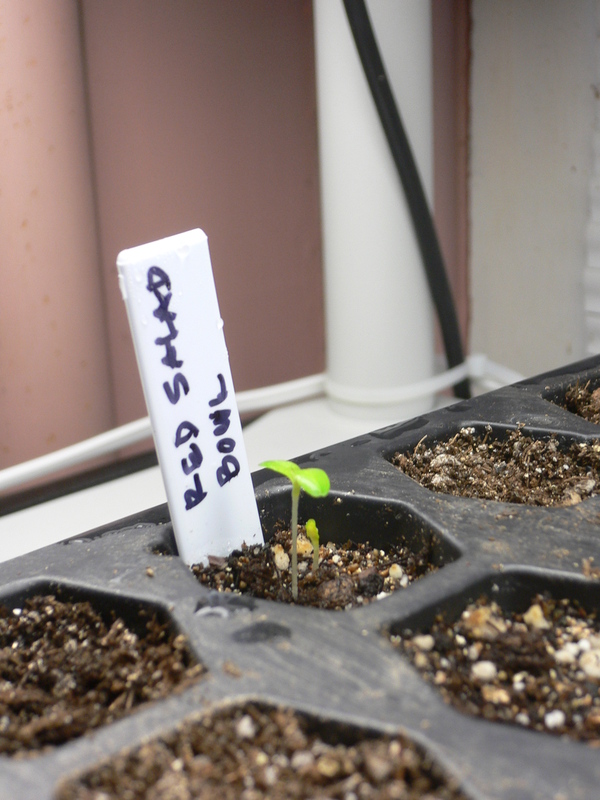 Then, I mixed up a batch of seed starting medium. 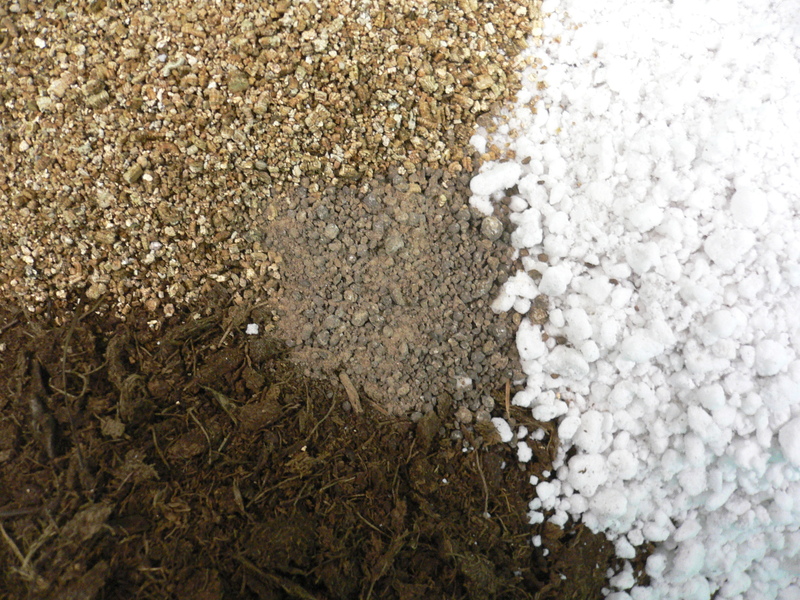 I measured out quantities of peat moss, vermiculite and perlite (in a 2:1:1 ratio) to equal a half gallon of dry volume and dumped them into the tub. 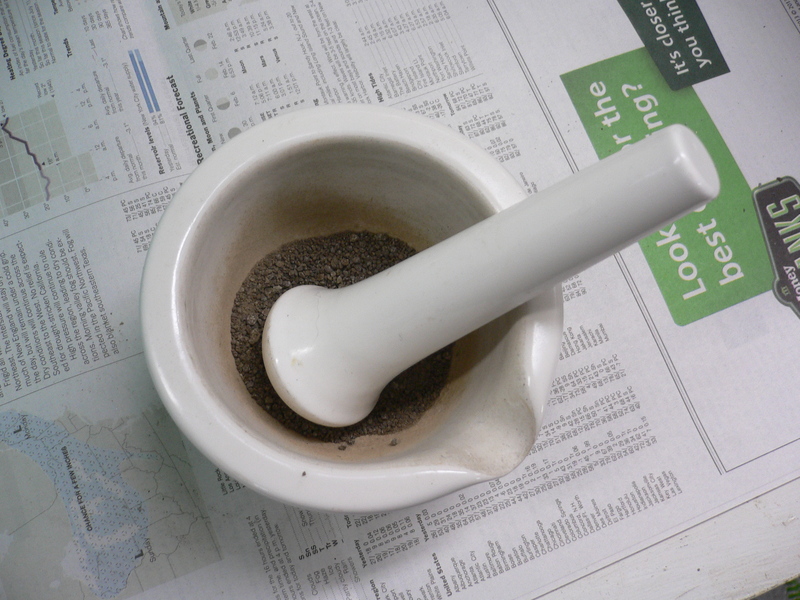 The lime I purchased is pelletized so I used a mortar and pestle to pulverize it into smaller particles. A quarter teaspoon per gallon—an eighth of a teaspoon for this batch—seemed much too small; I used a teaspoon. To be more accurate, I would need to know the pH I was starting with. Using a spray bottle, I moistened the mix and stirred it with the trowel. 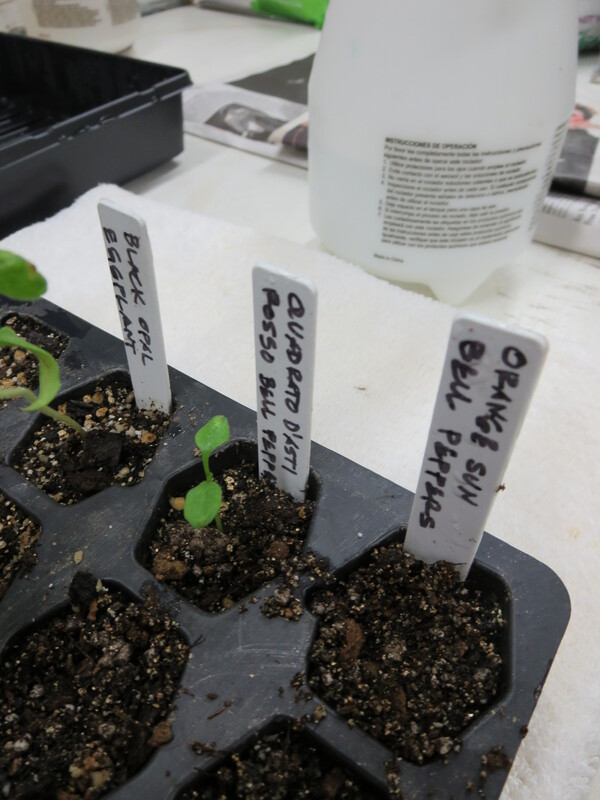 Peat moss is extremely dry and perlite can absorb a lot of water so I had to repeat this process for several cycles. 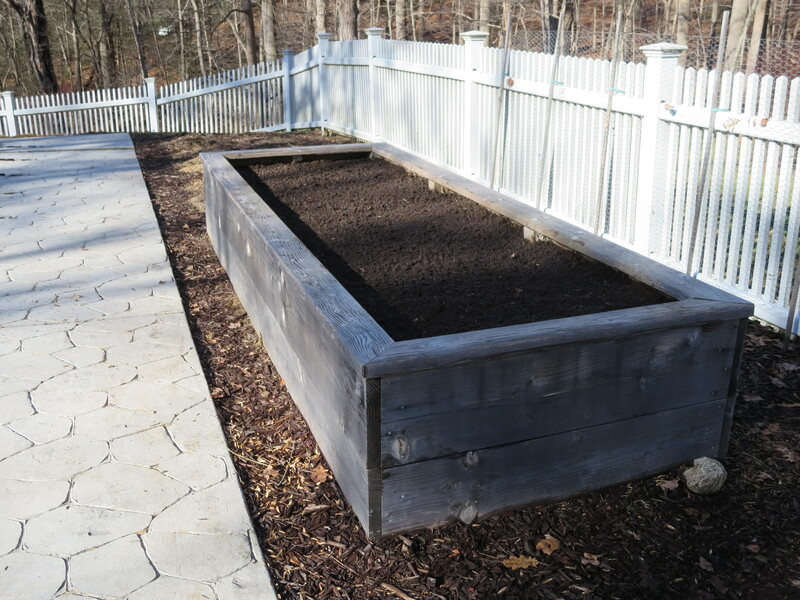 When the moisture content seemed right—damp but not soggy—I spooned the mix into a half seed tray (that’s 36 compartments) and tamped it in lightly. It turns out that half a gallon of seed starting mix is just the right amount. Next came the seeds. We will be planting basil again this year (last year’s did extremely well) along with the herbs we purchased seeds for last year but never managed to plant: rosemary, thyme, oregano, spearmint and sage. Because most herb seeds are very small, I used tweezers to drop one or two seeds into a shallow hole (formed using a pencil as a dibble) in each compartment. 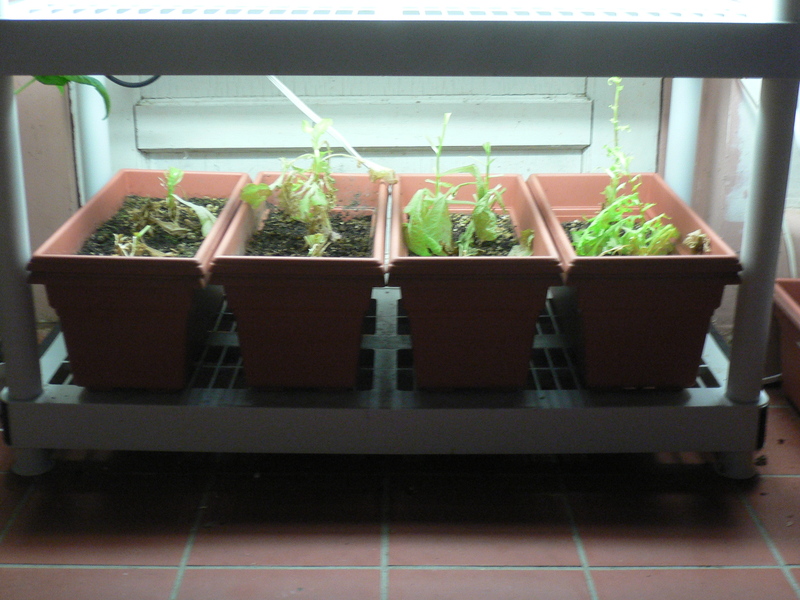 After covering the seeds with a pinch of mix (the recommended sowing depth for herbs is only 1/4 to 1/2 of an inch), I gently sprayed the tray with water until it ran out of the bottom. For most of the herbs, this will be the only water they get until they germinate and emerge from the soil 10 days (or, in the case of the rosemary, 28 days) from now. 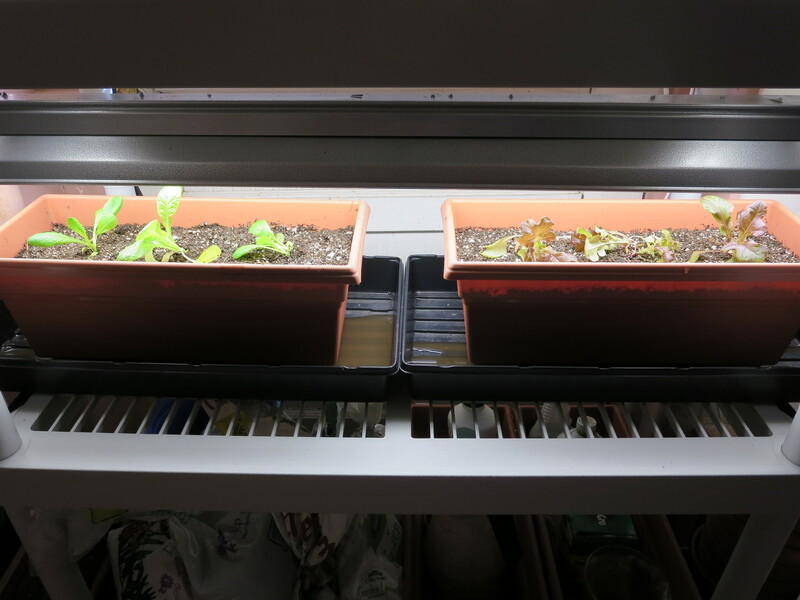 I set the covered tray atop a heating pad on a shelf of the seed starting apparatus, turned on the pad and fluorescent light and made sure that the timer was properly set. Like all seed sowing, starting the herbs is an act of faith. This is especially true for the oregano and spearmint whose seeds are teeny-tiny (they are packaged in small zip-top plastic bags within their paper seed packet). 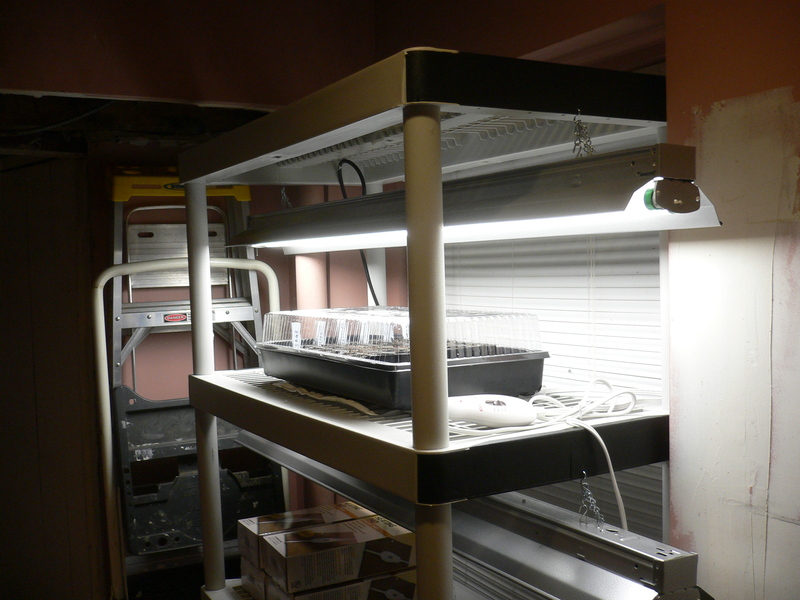 I can’t be sure whether any seeds actually made it into the soil or from which tray compartments they will sprout. But I firmly believe that they will and I will be thrilled when they do. This season’s unsung vegetables are the bell peppers and the eggplants. That’s probably because there has not been much to sing about. 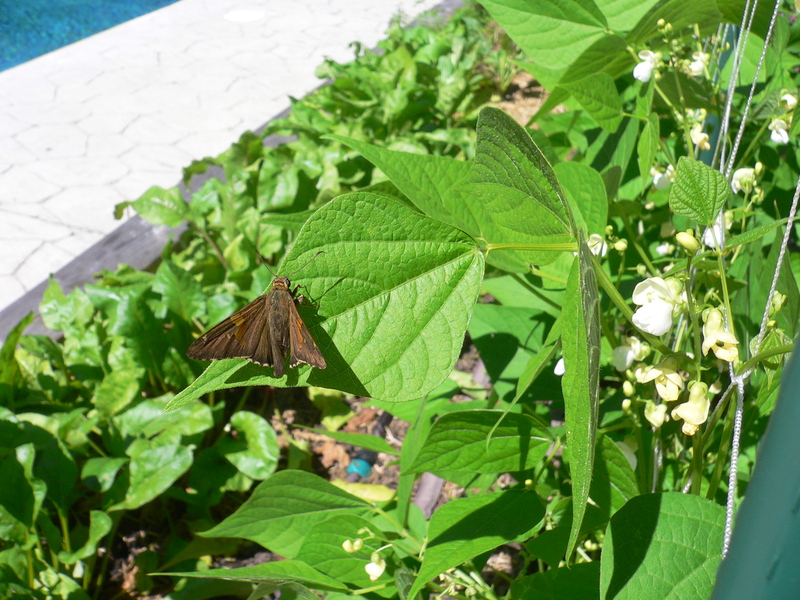 They have been steadily but quietly passing the days in the east planter, fending off intrusions from the nearby basil and enjoying the unobstructed sun they receive from the west (at least until the basil we transplanted there gets much bigger). But they have not produced much. 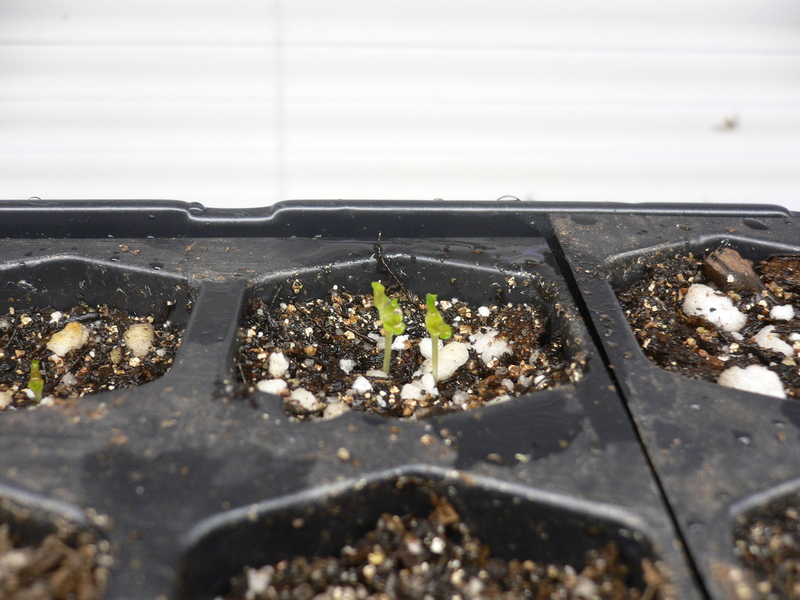 Each of the pepper plants carries one ripening fruit and of these, three attained full size a week ago. Since then, however, they have remained steadfastly green. Eventually (I hope), they will turn either red or orange (we didn’t note exactly where we placed each variety) signaling that they are ready to be eaten. Until then, we wait. 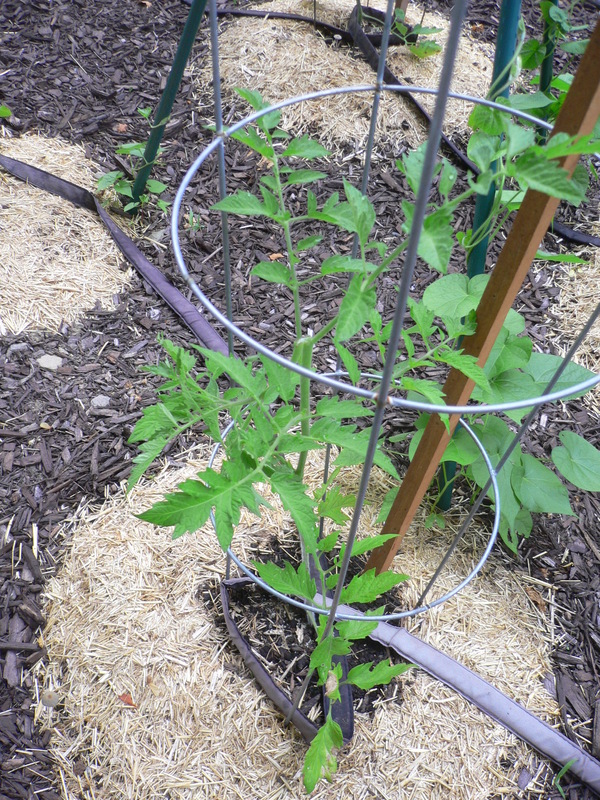 The eggplants, wedged tightly between the peppers and the basil, seem to be healthy enough. The main stems are tall—at least two feet—and their leaves are large, thick and lush. They remind me of tobacco leaves, another member of the deadly nightshades (family Solanaceae) to which they are closely related. They have also been producing the most delicate blossoms in an understated shade of purple. Beautiful as they are, though, it would appear that the pollinators in our neighborhood (bees, mostly) are not impressed by the color choice or do not care for the flavor of the eggplant’s pollen. 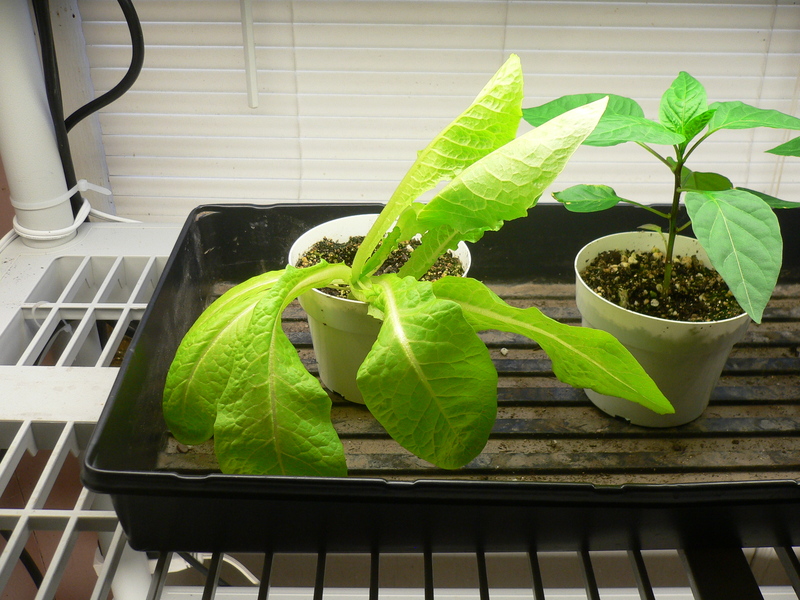 Whatever the reason, the flowers have not been successfully pollinated and no eggplants have formed. So: more waiting. Gardening is not for the impatient. At the other end of the garden, there is more to sing about. 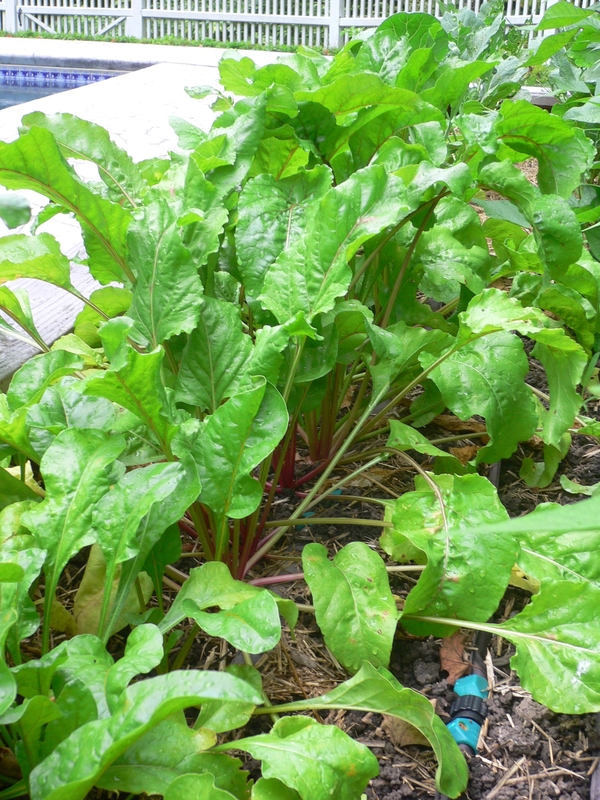 The string beans are nearing maturity and the beets continue to thrive. 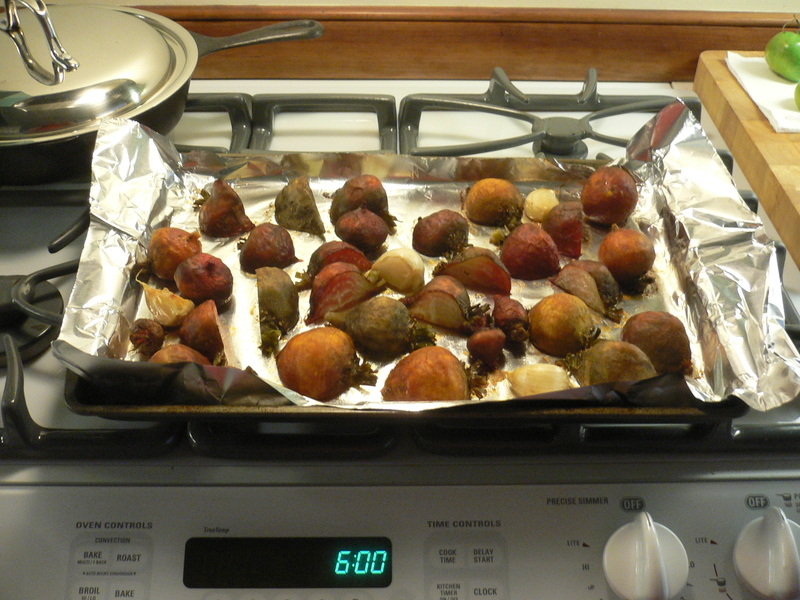 The beets have probably been harvestable for weeks (even accounting for this year’s slow growing season) but we’ve been storing them in-situ. 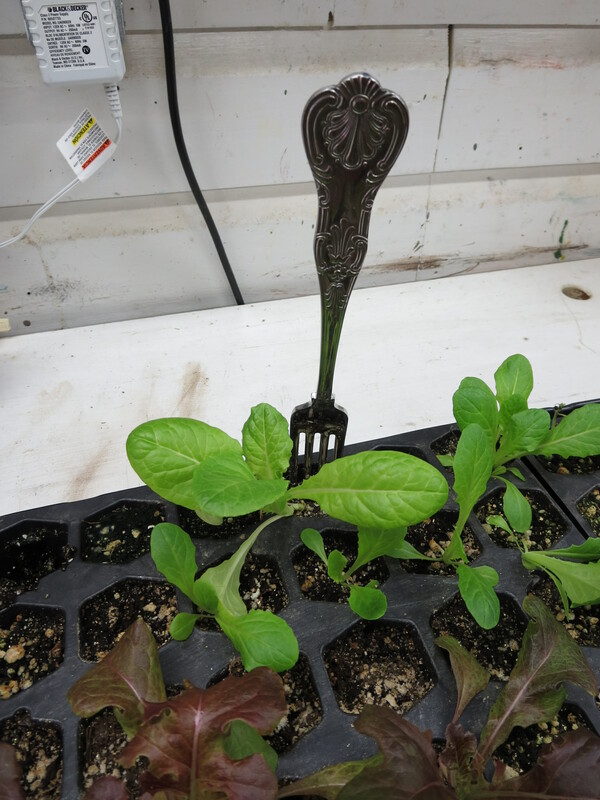 I think that the roots are better off in the ground than they would be in the refrigerator: The weather has been moderate and the automatic watering ensures that they do not become dry. 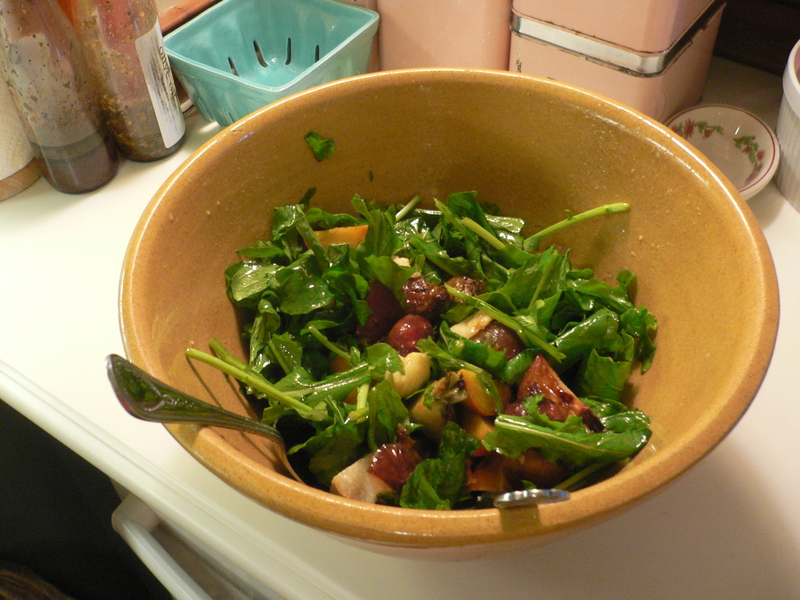 In the meantime, the greens have filled out and darkened in color, an indicator of their high concentration of nutrients. 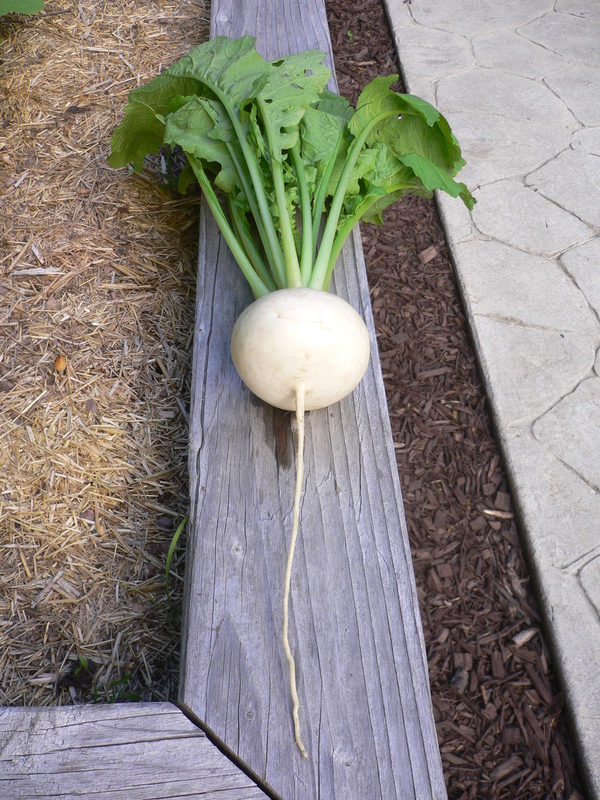 We continue to enjoy them when we do pull a few from the soil. 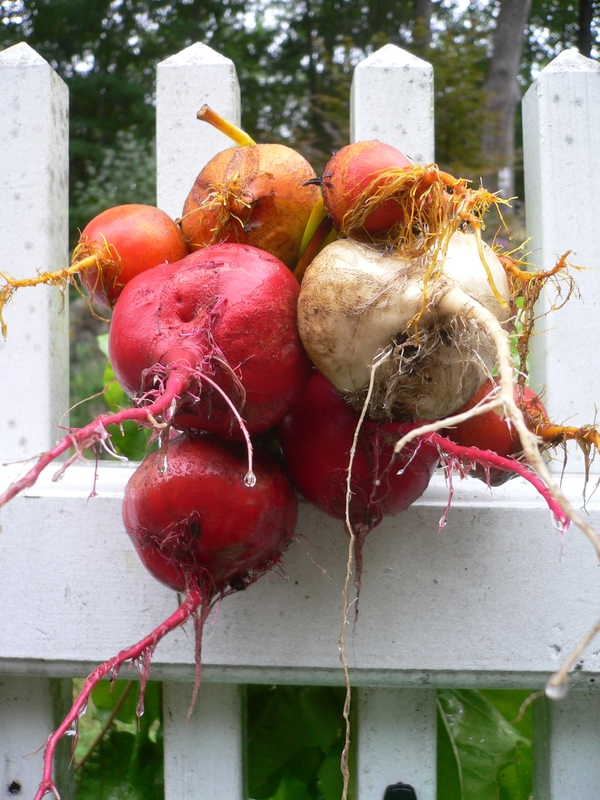 And we can’t get enough roasted beet roots. 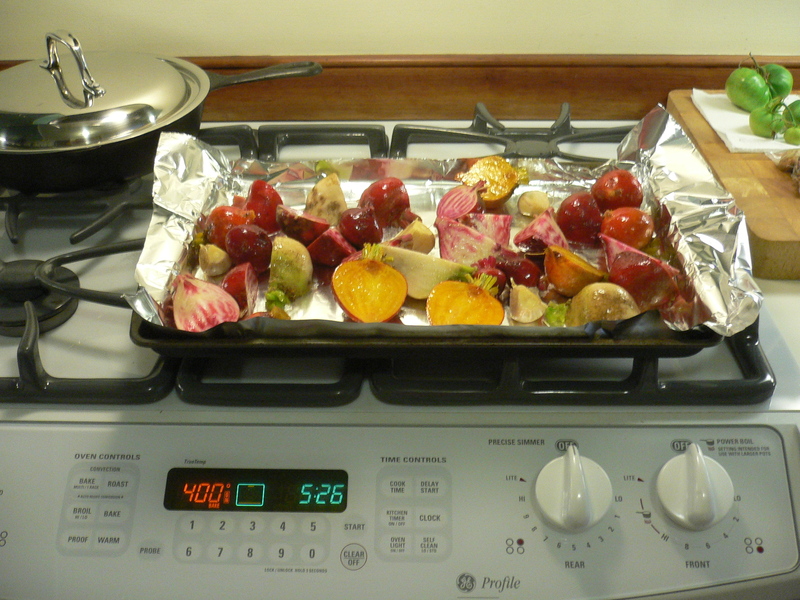 We save them for a relatively cool day when turning on the oven will not heat the house too much. 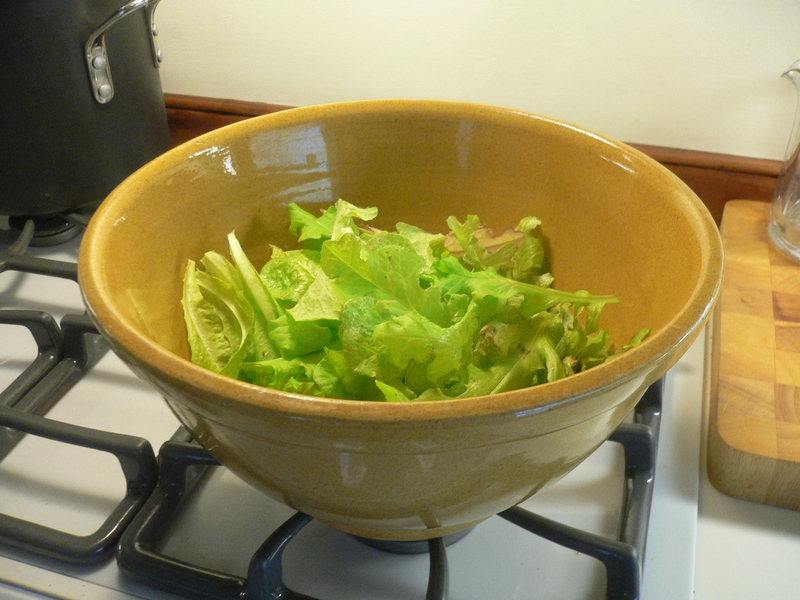 Then, we savor their deep, earthy flavor with bitter lettuces and a simple vinaigrette. They’re good enough to make me burst out into song. It’s a happy time of year in the garden. 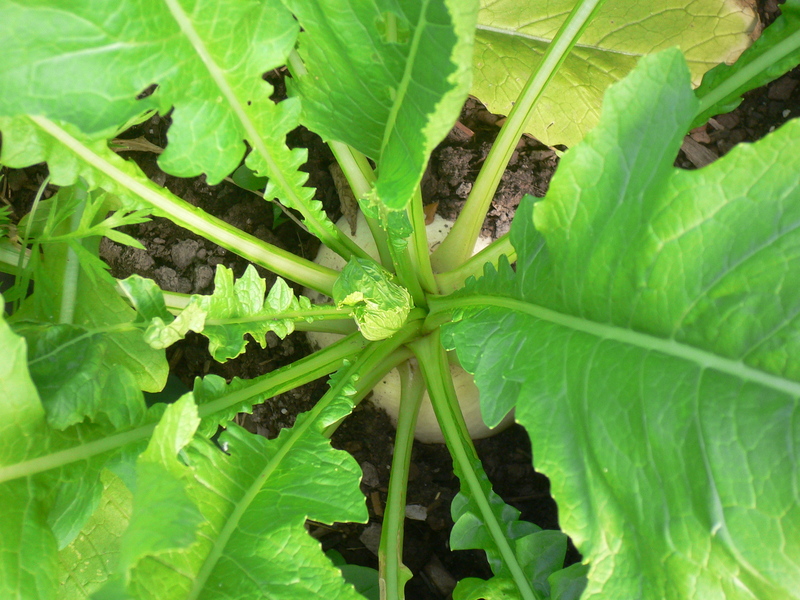 Everyone is growing with vigor and strength (every one of the vegetables, that is). Well, almost everyone. One of the cucumber vines is showing the unmistakable signs of bacterial wilt, having been infected (I presume) by the striped cucumber beetles who arrived in the garden only recently. The upper third of the vine is completely and irreversibly shriveled. 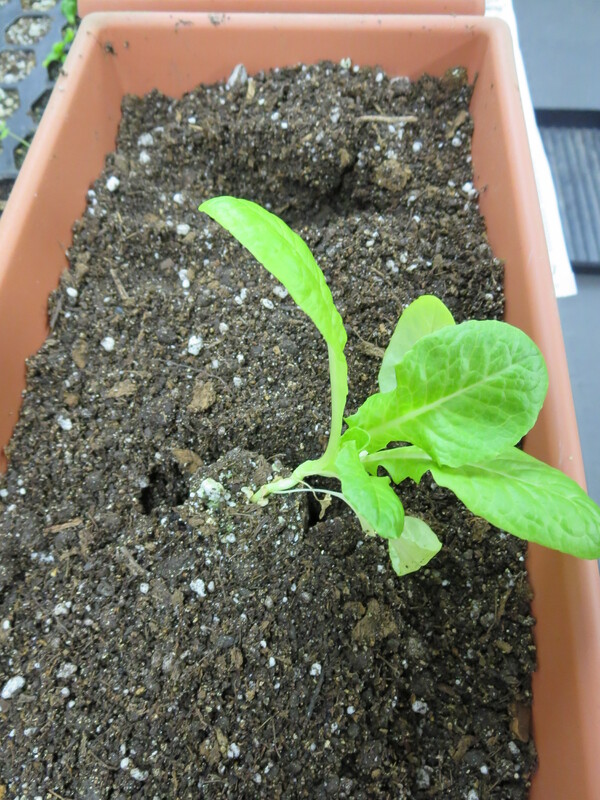 I snipped off the afflicted section and will see whether the condition spreads to the remainder of the plant. Based on experience, I’m fairly sure that it will but as my father used to say, hope springs eternal (he usually said this about our always-hungry cat). 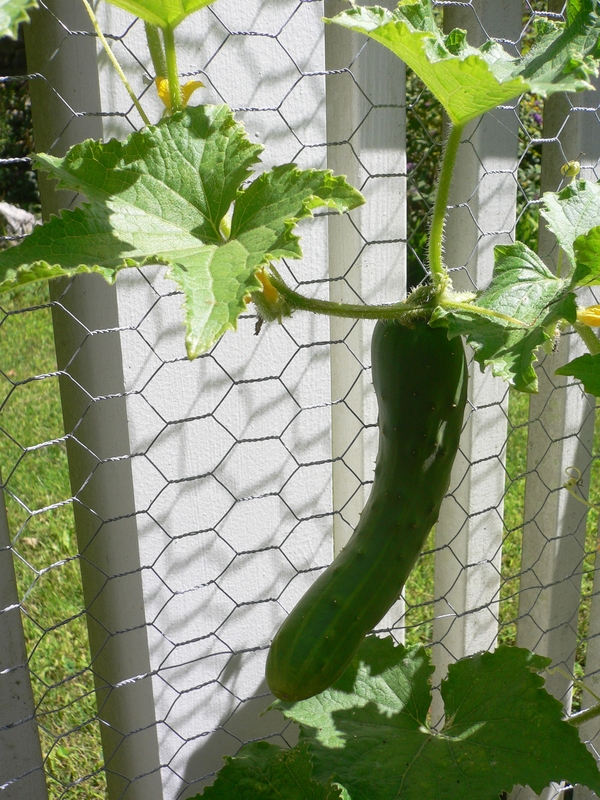 Bacterial wilt aside, the cucumbers have not been particularly successful this year. We are very happy with the varieties—they are the tastiest and have the silkiest texture of any we have ever grown—but the vines are small and weak and there has not been an abundance of fruit. Whether this is due to the particular cultivars, too little or too much water, the soil (very likely; we dug only small pits for the seedlings), or—who knows?—sun spots is not clear. 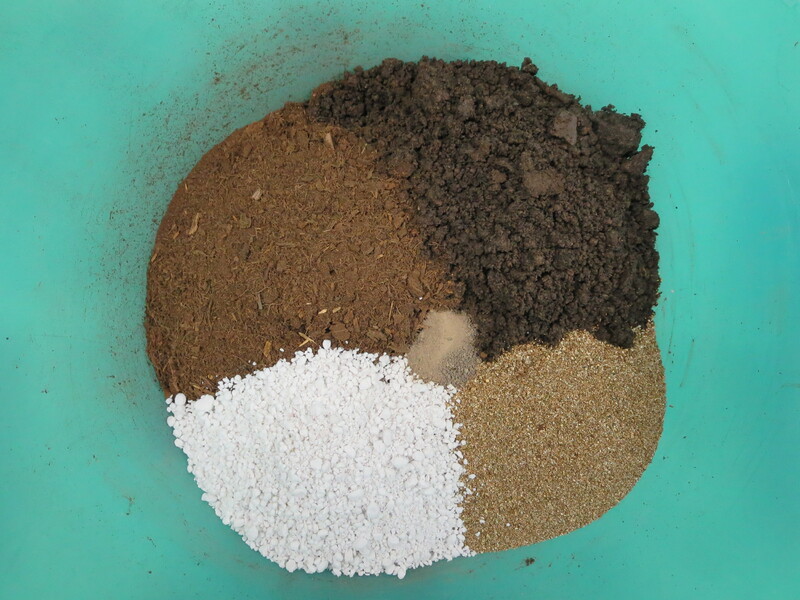 It is nearly time to take soil samples for testing and perhaps that will shed some light. It’s clear who the alpha squash in our garden is: the western Supersett Yellow crookneck. 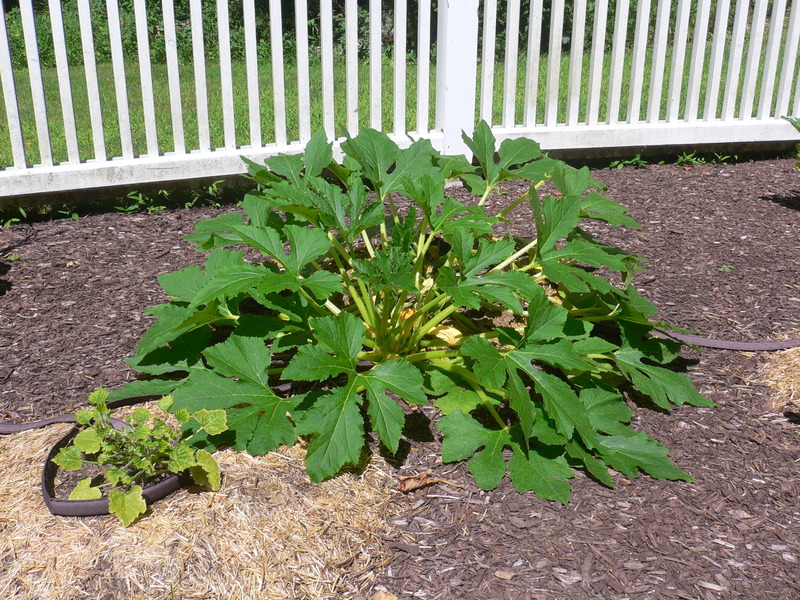 Of the four summer varieties, it has twice the volume of leaves (treating the plant as a hemisphere) as the others and easily four times as many squash growing at any given time. 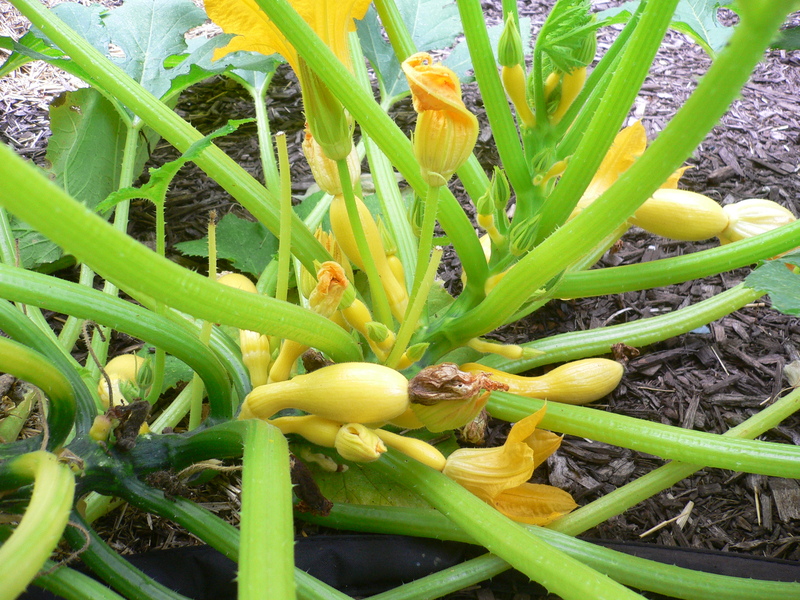 The other crookneck squash plant and one of the Cavili zucchini are next in size while the remaining zucchini plant is markedly smaller. Equally clear is the runt: the Zeppelin Delicata. 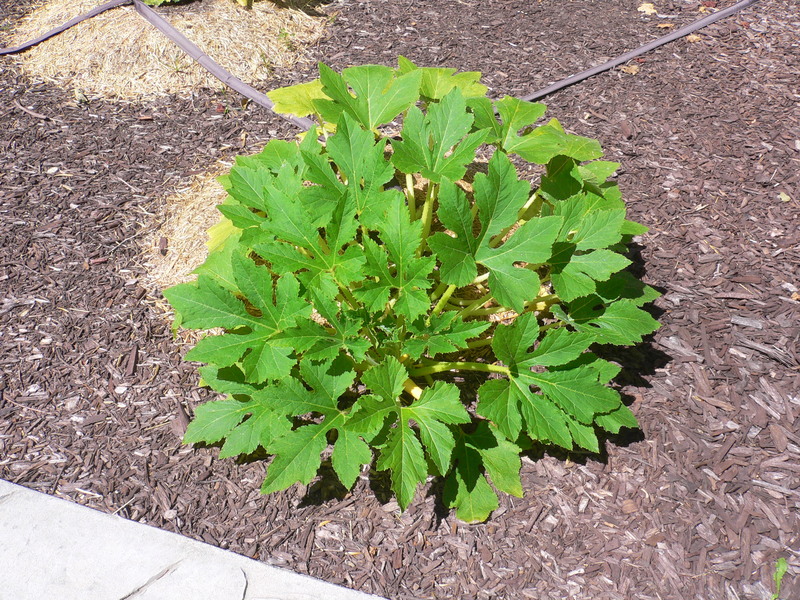 In fact, it is not much bigger than the summer squash seedlings were when we set them out back in May. 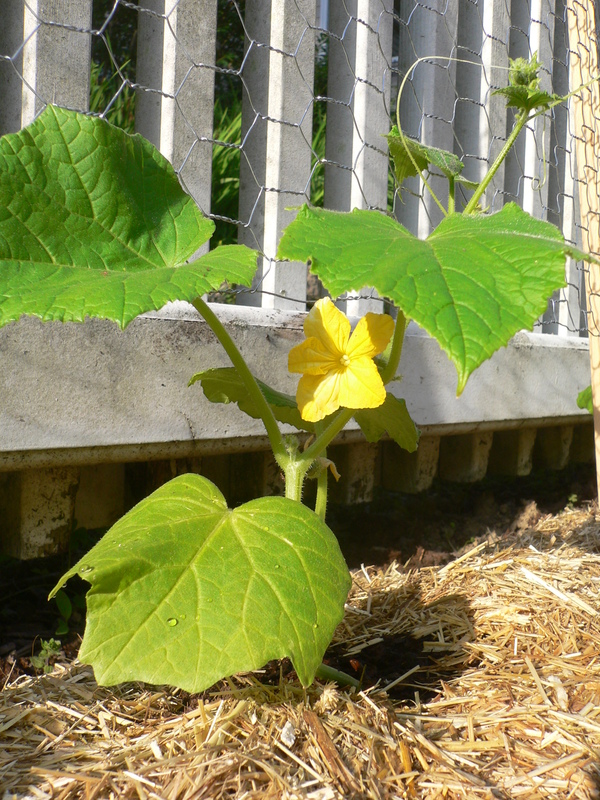 The Naguri winter squash (a Kabocha variant) cannot be easily compared to the others because it is a climber. However, if I coiled it up in a pile, it would probably be about the same size as the summer squashes, not counting the alpha. Why there is such variation is beyond me. All of the summer squashes were started in exactly the same way, given the same watering and fertilizer, potted up and set out at the same time, into the same soil, and watered by the same hose. 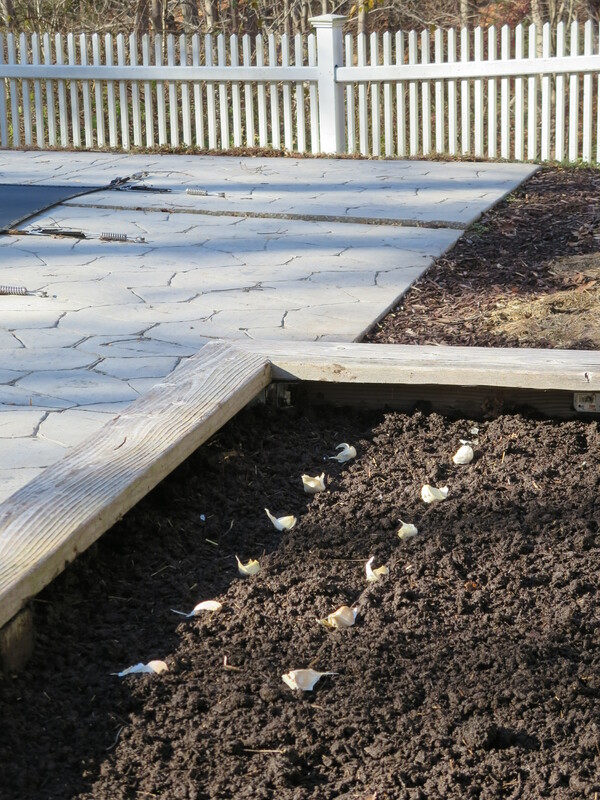 Similarly, the winter squashes were sowed outdoors in the same soil and have been watered along with everyone else. They all get the same amount of rain and solar exposure. 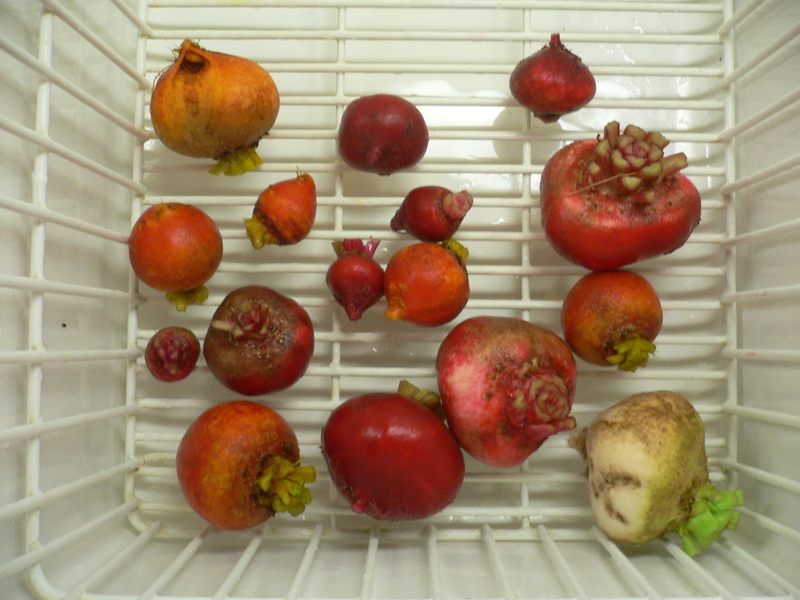 There are virtually no differences in their growing conditions. I suppose there is a minor difference in the amount of water each receives. 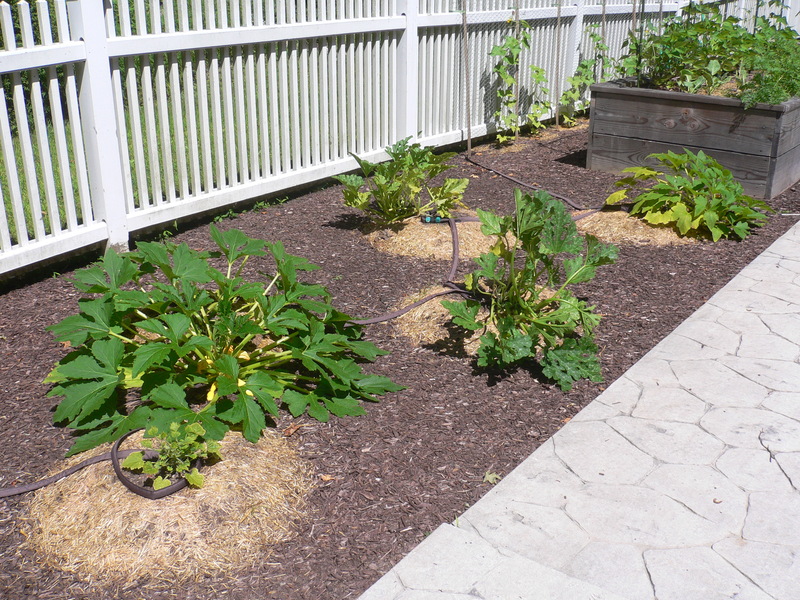 All six squash plants are on the same soaker hose and timer, along with the cucumbers. However, due to variations in the hose (there are actually two linked in the run) and the decrease in fluid pressure from the hose bib (high) to the capped end (low), the amount of water delivered by the hose varies along its length. The cucumbers get the most and the Naguri gets the least. But I don’t think that explains the differences. 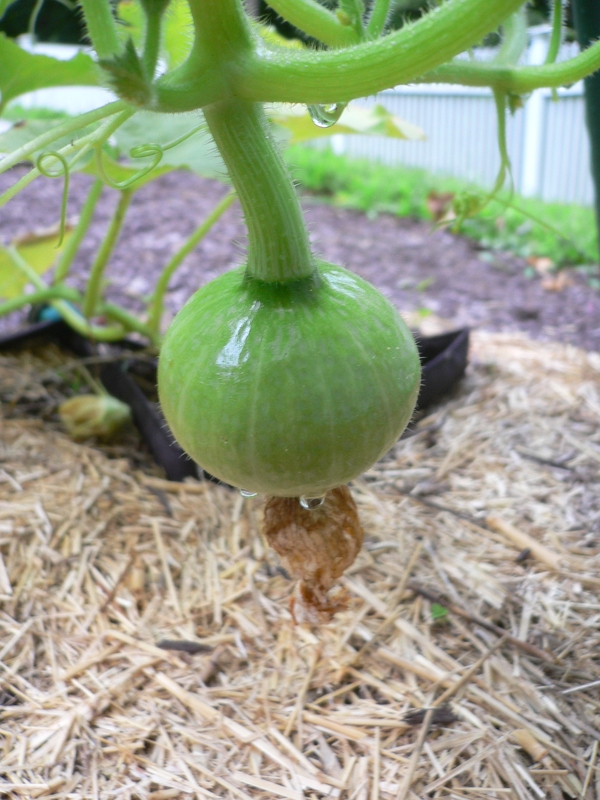 The alpha squash and the runt are adjacent to each other at the far end of the soaker hose. The difference in the amount of water each receives would be minimal. 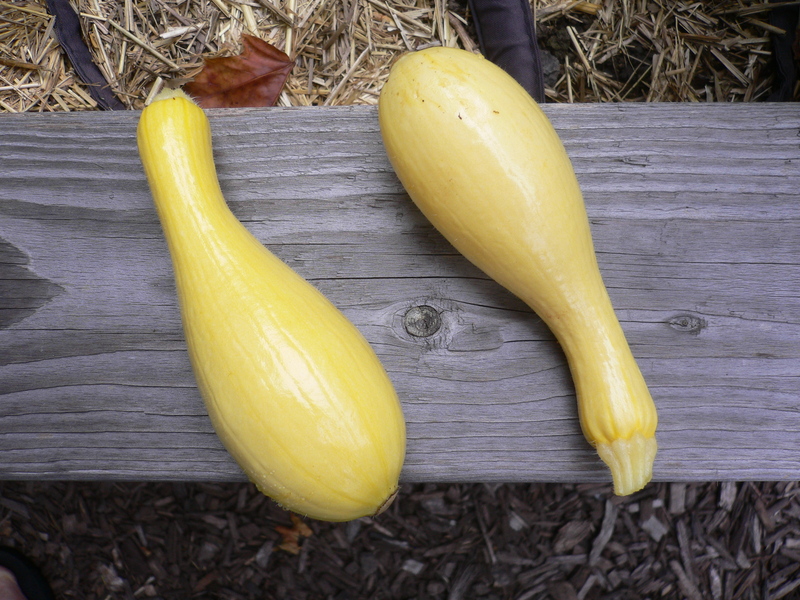 I guess that the variations are due mainly to differences between species (crookneck, zucchini, Kabocha and Delicata) and individuals (just as there are differences between each of us). 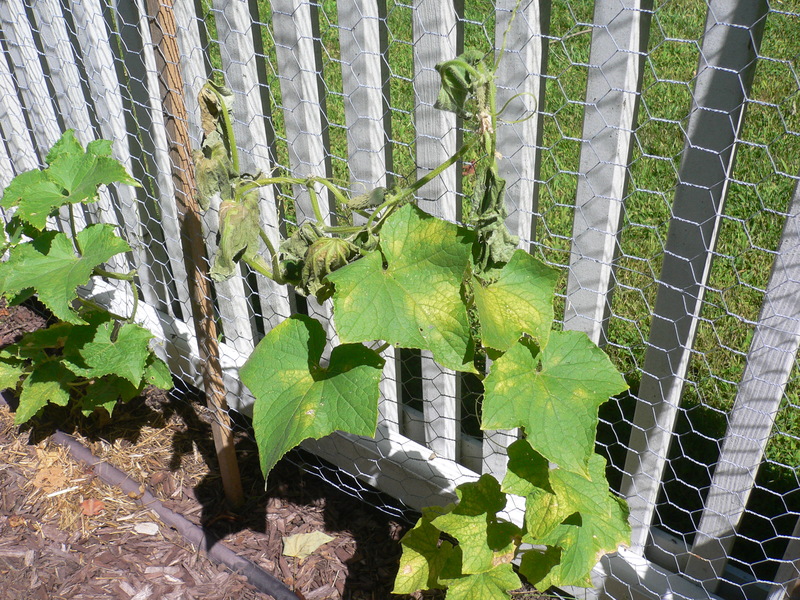 One thing that is the same about all of the squashes is that each is showing of powdery mildew. 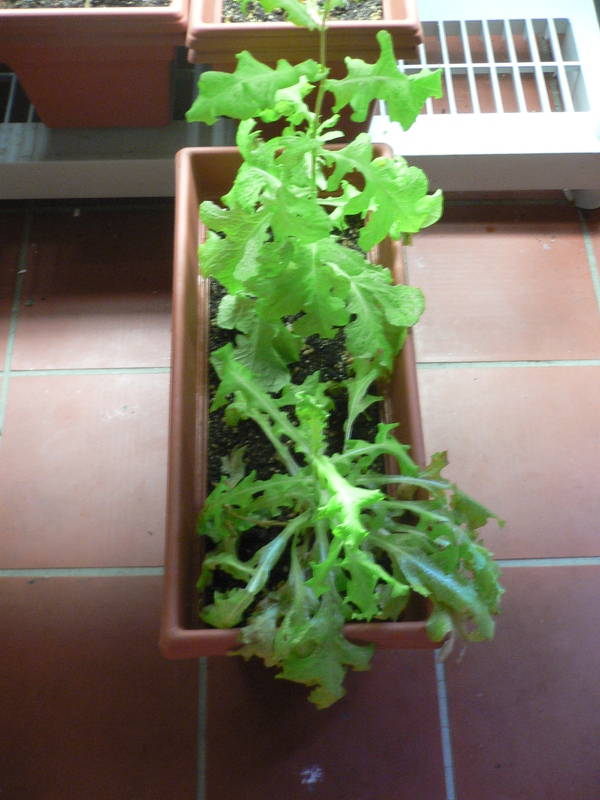 To combat it, I have started spraying the leaves with a solution of milk and water (diluted at a 1:10 ratio). I’m not very optimistic—the milk is the pasteurized supermarket variety and the spray is easily washed off by rain—but I will give it a try. While showing (off) the garden to new neighbors who just moved in at the beginning of summer, we were faced with a philosophical question: Does spraying the squash with milk, an animal product, mean that the squash is no longer vegan? It makes no difference to me—I’ll eat just about anything—but it could make all difference to a vegan.